The Ministry of the Arts and Multiculturalism is pleased to recognise Master ZENO OBI CONSTANCE in the field of playwriting and technical direction for stage. He has to date written over 20 award winning plays. In 1985 he was the winner of the National Cultural Council’s playwriting competition with ‘Duelling voices’. 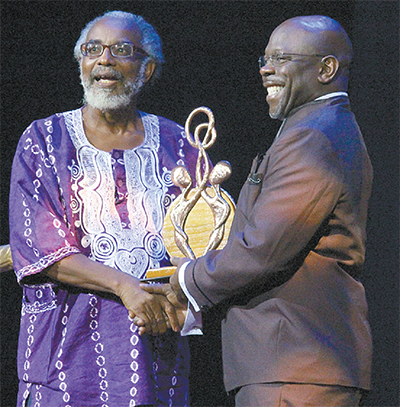 In 2003 he was honoured with the vanguard Cacique Award for his contribution to theatre at Secondary Schools where he has captured the Original Playwriting Award an unprecedented 15 times since 1978. He was selected as the Best Director at both the 2007 and 2008 Prime Minister’s Best village Trophy Folk competition. He has had the fortunate distinction of having his debut play ‘The Ritual’ offered as one of the texts for Year One students studying drama at the University of the West Indies while this play is also on the short list of texts for students writing the CXC Theatre Arts subject since 2003. ‘The Ritual’ has been published locally (and in Europe and the Caribbean by Heinemann Press and Carlong Publishers respectively) while ‘Duelling voices’ has been published by Macmillan Press. In 1994 he had the honour of having his Calypso musical ‘De Roaring 70’s’, recording the Black Power revolution of the 1970’s, staged by Canboulay Productions under the direction of Rawle Gibbons and Louis McWilliams. Another musical ‘The Road make to Walk’, examining the life and times of the Lord Kitchener, had its debut in 2003 with the Fyzabad Connection Drama Group. He has also written ‘Even The Dragon Can Dream’, a history of drama at the Fyzabad Composite School. A calypso collector, Constance has published works on the Calypso, including Poet And Prophet (1985), the career biography of Calypsonian Brother Valentino, and Tassa, Chutney and Soca: a study of the East Indian Contribution to the Calypso (1991).